The capital of Sicily, Palermo is a frenzied, pulsating city that wraps food, wine, and culture into one tempting package. Opulent (and decadently falling down) churches, romantic fountains, Baroque flourishes and sunglass-clad locals lounging in cafes in piazzas- these all characterize Palermo. The town lies in a spectacular natural setting, enclosed by Monte Pellegrino and beautiful Capo Zafferano in the south. This harbor city is a must for foodies as it boasts some of the best markets in the country, superb street food, some excellent ristoranti, and close access to many of Sicily’s most famous wineries (Donnafugata, Tasca d´Almerita, etc). Palermo is the main point of entry in the west of the country (with Catania on the east) and the perfect place to start your gourmet tour in Sicily. Be aware that traffic in Palermo is traffic is fairly insane and drivers (and pedestrians) seem to have nerves of steel in maneuvering around this fascinating and chaotic city. Historically, Palermo was as harried as it is today. It was founded by the Phoenicians in the 7th century BC (they called it “Ziz”, which means “flower”). Throughout the centuries, a parade of invaders — the Carthaginians, Greeks, Romans, Spaniards, Arabs, Normans, Byzantines, and Austrians, to name a few — marched through the city, eventually converting it into a cocktail of mixed cultures and traditions. These varied influences can be seen in the island’s cuisine as well as its architecture; the Cathedral exemplifies the eclectic building styles you´ll find in Sicily. An iconic example of Arab-Norman architecture is the Capella Palatina, located inside the Royal Palace, where the Sicilian Parliament now meets. Palermo is a fantastic place to explore on foot, although be forewarned: its historic center is extensive! Many of the most interesting attractions are clustered in the Quattro Canti, the historic center and the area where the “Four Corners” of its four main districts meet. Can’t-miss sights include the Capuchin Catacombs, a fascinating if a disturbing collection of tombs and preserved bodies; and the 19th-century Neoclassical Teatro Massimo, where the final scene of The Godfather III was filmed. Churches dot the “Centro Storico”; among the most interesting are La Martorana and Chiesa di San Cataldo, both with Arab-Norman elements, and Chiesa di Santa Caterina, with striking Baroque touches. Like any proper Italian city, Palermo doesn’t scrimp on romantic, open-air piazzas. Two favorites are the Piazza Pretoria, with its Renaissance fountain, and the Piazza Bellini, crowned with La Martorana church. Palermo’s mixed bag of cultural influences has had a profound effect on its cuisine. Many traditional Sicilian crops — lemons, tangerines and oranges, almonds, pistachios, grapes, and olives — were first introduced by conquerors. Even the iconic gelato has its roots in Arab sherbet. All this variety translates into pure pleasure for visiting gourmands. Pasta mixed with olives, red peppers or capers lead the way to sensual sweet-and-sour seafood dishes, which often feature humble fish like anchovies or sardines served alongside unexpected flavors like almonds, raisins or fruit. Tuna and swordfish are also widely served. Delicious vegetable dishes are popular too; one of the most typical is caponata, a casserole with eggplant, zucchini, olives, pine nuts, sugar, and vinegar. Palermo is the ideal place to try a variety of Sicilian wines. You will find the classic sweet Marsala in abundance alongside malvasias like Pantelleria and Lipari. Sicily is also gaining a reputation for dry white wines. Pair seafood with Catarratto-based Alcamo or wines from the DOC Etna, where producers like Benanti and Murgo are making excellent, aromatic wines. Beyond the DOCs, there are several innovative wineries working with other grapes, like Inzolia, Grecanico, and even Chardonnay; the island’s most famous white wine is a barrel-fermented Chardonnay from the winery Planeta. Red wines, however, may be Sicily’s future. The Nero d’Avola grape, a Syrah-like grape used both for blending and on its own, has been getting massive attention in recent years. Classic Sicilian reds, like Tasca d’Almerita’s Rosso del Conte and Corvo’s Duca Enrico, are facing competition from producers who are relative newcomers to the high-end red scene, like Morgante and Ceuso. While Palermo has literally hundreds of churches and chapels, there is only one “cathedral” and dates back to the 12th century. Norman by foundation, it features architectural touches from as varied as 15th-century Catalan Gothic portals, to Baroque cupolas to an 18th century Neo Gothic dome. The treasury (Palermo Cathedral Museum) inside includes an amazing Imperial gold crown from Queen Costanza of Aragon, Spain, and many jewels. 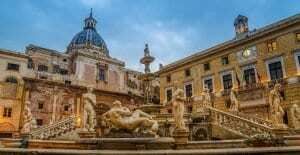 Absolutely gorgeous and “a must” while in Palermo. It is very close to the Palazzo Conte Federico, one of our favorite Palermo gems. Without a doubt, one of the most intriguing markets in Palermo is the Vucciria (situated between Via Roma and Corso Vittorio Emanuele)-a treat for the gastronome’s eyes. Find delicacies like Sicilian blood oranges, Bronte pistachios, Sicilian Pecorino and “Formaggio Ragusano” (cheese from the Baroque town of Ragusa), capers from the Aeolian islands, Pachino tomatoes, plenty of “Pesce Spada” (swordfish), “Tonno” (tuna, especially from Favignana), Modica chocolates, and a major offering of aromatic street food like “Panelle” (delicious deep fried garbanzo patties), “Pani Ca´Meusa” (warm rolls stuffed with calf’s spleen- tastes better than it sounds!) 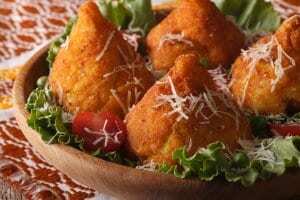 and “Arancini di Riso” (deep-fried rice balls often flavored with raisins and meat). This market is so entrenched in the local psyche, that a colorful expression in Sicilian dialect says “Quannu s’asciucanu li balati di la vucciria”, which translates as “When the streets of the Vucciria dry up” and colloquially means “When pigs fly”- ie when something is highly unlikely. While in Palermo, pick up a print of Renato Guttoso’s famous painting “La Vucciria”. The Royal Palace on the Piazza Indipendenza, now the seat of the Sicilian Parliament, hides a wonderful 12th-century chapel where you can see mosaics and a great example of Arab-Norman architecture. Elsewhere in the palace, seek out King Roger’s opulent, mosaic-dripped bedroom, the Sala di Ruggero. Underground Palermo! You can actually tour the ancient “Qanat” (manmade underground canals dating to the Norman period in Palermo, the technology dates back to Ancient Persia). Macabre, eerie, spooky… they’re all words that aptly describe the underground tombs here, which date to the end of the 16th century. The bodies of Capuchin monks and others were preserved in the catacombs in horror-movie-worthy style. This Neoclassical opera house, finished in 1897, is a symbol of the unification of Italy and, for film buffs, is where the final scene of The Godfather III was filmed. They hold all manner of opera and music events and festivals, and it is well worth making the effort to attend a show here. A favorite of many Palermitans, this Arab-Norman church has an imposing bell tower and a beautiful mosaic interior. Named after Eloisa Martorana (founder of a Benedictine chapel close by), this church was erected under George of Antioch (an admiral in Roger the Second’s fleet). Also done in the iconic Arab-Norman style, this church has a distinctive dome and stands next to La Martorana. Its Baroque dome is among the city’s most beautiful.